Anyway, I didn’t want to get political or anything, I just wanted to introduce my last experiment, inspired and made uniquely in celebration of Kalyn and her Weekend Herb Blogging anniversary. I thought how I could use, besides desert, one of my favourite herb: lemon verbena. 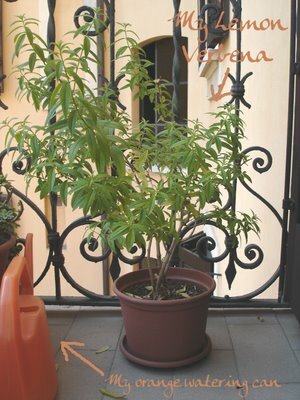 My father in law (the same of the rabbits) made me a little plant from his and since then we have it on our balcony. It is a perennial shrub, happy with a lot of sun and water, extremely easy to grow: you just need to give it water! Place the rabbit in a shallow dish greased with oil. Season it with salt and pepper and scatter over it lemon verbena. Let it rest in the fridge for at least 4 hours. Pre-heat the oven at the highest temperature and cook the rabbit for 20 –30 minutes, brushing it often with lemon verbena leaves. Serve hot with some steamed vegetables. Interessante quest’erbetta! la voglio provare. per il coniglio non prometto nulla, ho avuto per anni una coniglietta per casa e proprio non ce la faccio! Very interesting. I’ve eaten rabbit quite a bit because when I was a kid we raised them to eat. I remember liking it much more than chicken in those days. What a creative use of verbena,and the first vote for this herb. I have some of this is my herb garden and someone told me you can use it in place of lemongrass in Asian cooking. Have you tried that? I have a hard time finding lemongrass in the stores here. Che coincidenza…Ho imbottigliato giusto oggi il liquore fatto con la cedrina! Non vedo l’ora di assaggiarlo! ….pensi che per me potrei sostituire il coniglio con il pollo? 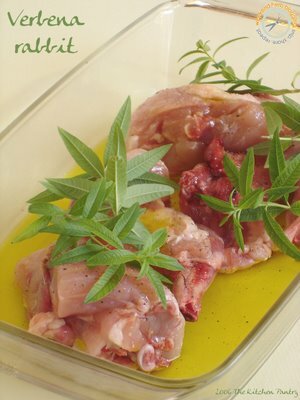 Pensi che per me potrei sostituire il coniglio con il pollo? Hai altre ricette con questa pianta? This is one of the first posts I’ve seen for WHB #52, seems I better get my skates on. I absolutely love rabbit, especially cooked in the “non-english” style – other countries seem to manage so much more. We don’t often see rabbit for sale here. I do like it though. I’m particularly interested to see your recipe that features lemon verbena. Many thanks for posting it. We have tons of lemon verbena! We use only small amounts of it though – for Thai dishes in place of lemongrass (it works very well, Kalyn), or in mint pesto.